Kelela let out a small little lie concerning the release of her EP, Hallucinogen, as after releasing the Arca-produced single, "A Message", a May release date was promised. May came and went and silence from the Cali-based avant-R&B vocalist. This week, though, she's made up for the gaffe, as she not only has set a new release date for the follow-up to 2013's superb Cut 4 Me mixtape (October 9th! ), but to thank us for our patience she's released a little audio goody to tide us over till then. Co-produced by Kingdom and Nugget, "Rewind" is an luminous astral joint, that nudges at old school sensibility with it's programmed percussion and bouncing bassline. Kelela describes the song as a "breathless euphoria of infatuation", and she ain't lying, as her Janet Jackson-styled vocals glide effervescently across the chilled n' moody soundscape forming a perfect combination out of diverse concepts. 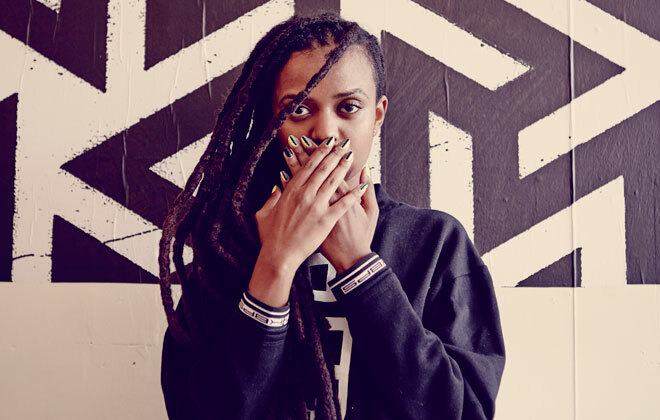 Kelela has been ruling the nocturnal electro-soul roost for awhile, and "Rewind" is yet another jam to keep her on top.